We are facing a new era of defining what constitutes a park. No longer seen as simply grass and trees, parks provide a multitude of benefits to their users. In the past, parks brought an element of the country into the city. They provided relief from overcrowded housing conditions and congestion. They later evolved into recreation centers and facilities. These park functions all continue to have value today. Parks, however, have begun to play a more integrated role in our urban environments. They provide formal and informal gathering places for building community. They help to positively influence property values. They give city dwellers a place to connect to the natural world. They make our urban areas more inviting for living, working, and relaxing. To understand what the urban parks of the future — and the cities in which they exist — will be, urban leaders need a venue for addressing the challenges of creating and enhancing parks in their cities. The City Parks Forum provided this venue. Projects from nine cities — Atlanta, Chicago, Cleveland, Houston, Los Angeles, Miami-Dade County, Philadelphia, Seattle, and St. Louis — are profiled. These projects highlight how planning and park professionals can collaborate to promote economic development, improved public health, and green infrastructure. 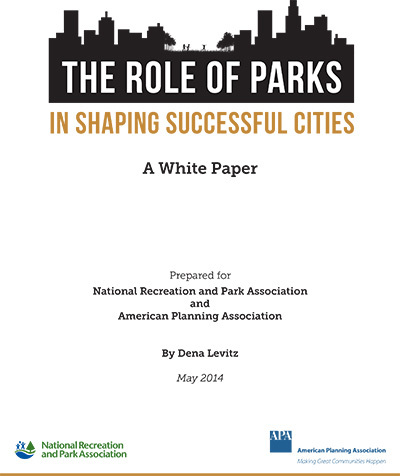 This is an exciting collaboration between the American Planning Association and the National Recreation and Park Association that aims to better utilize parks in planning vital, livable communities. The stories below began as case problems identified by our mayoral fellows at one of our six symposia. Using our program faculty expertise, grant funding, and most of all, considerable community resources, our grantees have addressed their park challenges in a variety of ways. Common to all their efforts, though, are the themes of public-private partnerships, community engagement, leadership support, and using parks to address other urban challenges. The City Parks Forum salute the vision and tireless effort of these communities and hope these projects can serve as examples for others. We have developed a series of briefing papers, written by nationally recognized park and open space experts, on topics that past mayoral participants have identified as the most pressing issues facing their cities. A bibliography of urban parks resources was developed specifically for The City Parks Forum. This bibliography includes information on park design, financing, public/private partnerships, stewardship, and usership. This program was made possible by a $2.5 million grant from the Wallace Foundation and the Doris Duke Charitable Foundation.